With the dryer's Express Select one-touch controls, choosing from its 13 dry and 4 specialty cycles is easier. It has a Moisture Sensor, a built-in device that automatically shuts down the unit when the clothes moisture level is confirmed dry. Free the garments from up to 99.9% of bacteria by using the dryer's NSF-certified Sanitize cycle. The dryer's 7.0 cubic feet stainless drum is meant for average residential use. It has a total of 13 dry cycles, including the basics such as Normal, Towels, Heavy Duty and Delicates; and 4 specialty cycles that dries almost everything from toys to sports wear. The Steam Refresh cycle refreshes garments; an option called Anti Static is a setting that helps stop static, while the Wrinkle Release option practically irons out wrinkles on clothes. All these three options use the dryer's Ready Steam technology. Select from the dryer's 5 temperature levels, including Sanitize, a high-temperature setting that destroys up to 99.99% of harmful bacteria. For delicate fabrics, a no-heat setting called Air Fluff is advised. Temperature levels also include High, Normal and Low. The stainless steel Fits-More drum is fitted with an interior light and lint screen. A drying rack is sold separately. The estimated tumble speed is 50 rotations per minute. The Express-Select one-touch dial and controls are simple to use. The front controls also come with a Time Remaining indicator and Cycle Status light. Buttons to Start/Pause and Cancel the cycle are accessible. Chrome-edged circular door is placed right in front of the dryer's body for easy loading and unloading. It is fully-reversible, making the unit ideal for laundry rooms with small spaces. A Dryer Stacking Kit is handy if the dryer is to be perched on top of a compatible washer. The optional Pedestal will also serve as organizer. The Mobile Home Installation Kit and LP Gas Conversion Kit are sold separately. This 27 inch-wide and 36 inch-high dryer unit is fabricated from rust-proof stainless steel. Available colors for this model are: Classic Red, Classic Blue, Classic Silver and Classic White. The unit has 13 dry programs and 4 specialty cycles. Very high temperature is used for the NSF-certified Sanitize setting. Garments are deodorized with the Ready Steam cycle. Static formation is prevented with the Anti Static option. Manufactured with the SilentDesign Ultra, the dryer keeps quiet during a cycle. The system is automatically turned off when the Moisture Sensor senses finished loads. The features on some of the dryer's 13 cycles are identical, making the other cycles unnecessary. Some dryer brands include a drying rack in no additional cost. 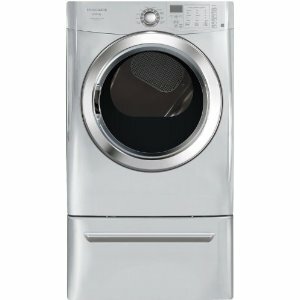 A 27-inch wide dryer usually holds up to 7.4 cubic feet while this model holds just 7.0 cubic feet.